Elkagorasa the Casual: Woah! Leveling SLOWS! As I anxiously dungeon my bear up in the levels, I am once again introduced to the complexity that was only found in Vanilla. 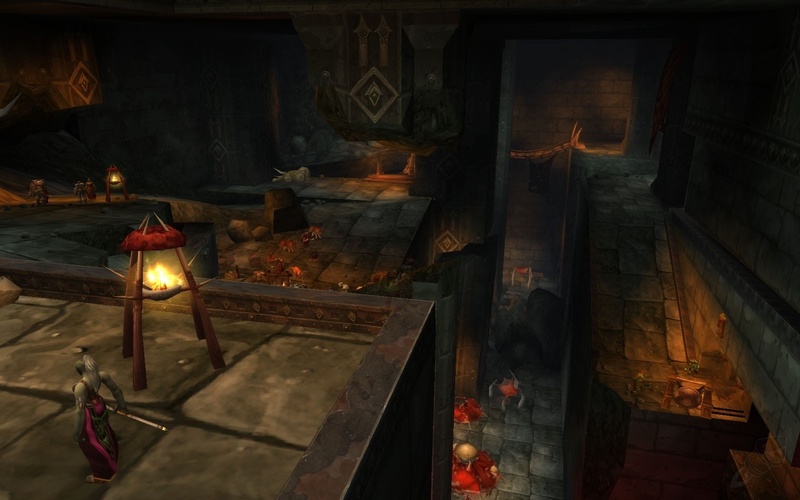 The dungeon of the day is Blackrock Spire. This dungeon has 9 bosses in the 'upper' region and 5 more in the lower region. There are 7 different 'floors' to this map, with several shortcuts between each level. If I was a Blizzard level designer, this would be my masterpiece. I think this would be a perfect level for Warlords of Draenor (Orcs, Ogres, and Spiders Oh My!). 83 minutes at level 57! Play time has reached a soaring 2100 minutes! (1 day 11hrs) to reach 57.99. Yeah, I am only 2000 xp from reaching druid flight form. I was so torn to just run one more dungeon, or maybe go fly out to the next zone and grind some beasts, but I decided to simply wait for next time I can run dungeons. Probably later this weekend. Now, what I was really surprised to see was my time played this level. 83 minutes completely blows away my previous times of approximately 35 minutes per level. Mathematically it averages out, but there is a spike coming along. My guess is that at 58, I'll start finding parties that can run BC dungeons and I'll start grabbing the expansion inflated XP from them. On the other hand, I ended up running, BRD 8!! times. By my last run, I was getting a measly 20 xp for some of those darn dwarves. Very possible no healer in the right levels to complete anything higher with me. After playing a healer, I realize that I am very conscious of the healer. Do I have LOS of the healer after I gather up all these dwarves? Is the healer in the room with me before I pull these mobs? From playing a warlock, I like to gather up all the mobs into a single area, then stay put. This way my DPS can use their AOE spells and take down the entire crowd. Speaking to you affliction warlock, please don't play with the succubus in a dungeon and let her keep seducing mobs, darn it... You're slowing us down! Hunter, if you keep letting your dragonkin pet aggro mobs, I'll let him. Just make sure he stays alive, because they're coming for you next. Oh, sorry, guess we have to revive you (again)..
Found Rebirth today. Oh!, look I have a brez and a normal rez. Now have both on my button Wouldn't have been useful in BRS today when the healer died, I was surrounded by mobs. Sorry. I have been reorganizing my button bar. In addition, I just mapped my mouse button4 to charge and mouse button5 to a FarieFire mouse over macro. I was thinking of putting Barkskin on a mouse wheel flip. and maybe berserk on mouse wheel down, but haven't done that yet. Today's Azeroth Choppers had the Blizz teams come out to NY and check out the bikes. I loved Metzen's quote "for working with a company called Blizzard, I bet none of them have cold weather gear." I got thinking about the Horde fenders, and thought they looked familiar. As I was grabbing the screen shots, I saw this. Hmm, spikes on red, ringed with another silver edged. Then, I thought they gave up on the tusk forks for the die-cut ones. Thought it a little odd they removed the spike at the end, but here are the new tusks. Will we only see the die-cut ones from the sides? Through the wheel? Add some tusk spikes, some fluffy boots, it will be Garrosh, riding a scorpid theme'd bike. Just need a skull license plate on the front (ala belt buckle). Story idea, Garrosh escapes the prison and jumps on his own custom hog. Races to Nagrand as we know it now and frets. Varian on his Alliance bike, race after him. (Just need eagles on fenders?). Now both classes get bikes.